Deric's MindBlog: The science of mind wandering. Conscious experience is fluid; it rarely remains on one topic for an extended period without deviation. Its dynamic nature is illustrated by the experience of mind wandering, in which attention switches from a current task to unrelated thoughts and feelings. Studies exploring the phenomenology of mind wandering highlight the importance of its content and relation to meta-cognition in determining its functional outcomes. Examination of the information-processing demands of the mind-wandering state suggests that it involves perceptual decoupling to escape the constraints of the moment, its content arises from episodic and affective processes, and its regulation relies on executive control. Mind wandering also involves a complex balance of costs and benefits: Its association with various kinds of error underlines its cost, whereas its relationship to creativity and future planning suggest its potential value. Although essential to the stream of consciousness, various strategies may minimize the downsides of mind wandering while maintaining its productive aspects. Evidence for the default mode network (DMN) as the substrate of the self-generated thought. The DMN is a large-scale brain network defined by the temporal correlation between activity in two core regions on the medial surface of the cortex, known as the posterior cingulate and medial prefrontal cortex. These regions form the core of the DMN (yellow) and interact with subnetworks including the medial temporal lobe subsystem (green) and the dorsal medial subsystem (blue). 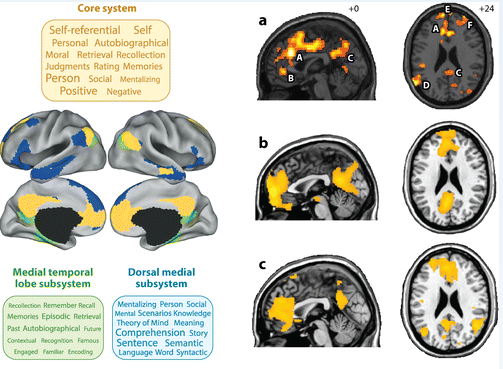 Meta-analyses using Neurosynth have shown that the core of this system tends to be engaged in self-referential processes, the medial temporal subsystem is engaged by episodic processes, and the dorsal medial subsystem is engaged by social processes. Together, these forms of thought are similar to the content of the self-generated thoughts that often occur during mind wandering, providing important evidence for the involvement of these regions in the mental content that occurs during mind wandering. Studies using experience sampling in conjunction with functional magnetic resonance imaging have shown that these regions show heightened activity during periods of task-unrelated thought (a–c). These brain images show that regions of the core aspects of the DMN exhibited greater activity during periods of task-unrelated thought. Regions: A, dorsal anterior cingulate cortex; B, ventral-medial medial pre-frontal cortex; C, posterior cingulate cortex; D, right temporal-parietal junction; E, dorsal medial prefrontal cortex; F, left rostral-lateral prefrontal cortex.